Randall Children’s Hospital at Legacy Emanuel is excited to host its Healthy Kids Street Fair featuring fun, healthy, and safe activities for families and kids. This free annual event is on Saturday, August 9, from 10:00 a.m. to 2:00 p.m. outside of Randall Children’s Hospital at 2801 N. Gantenbein Avenue on the Legacy Emanuel Medical Center campus in Portland. The fair celebrates healthy living and promotes safe family fun with a variety of interactive activities hosted by the hospital and community organizations. Kids may tour the KIDS Team ambulance and see a Portland Fire & Rescue fire truck up close. 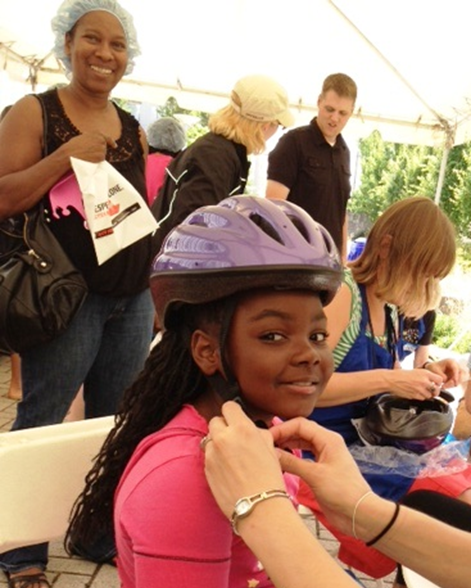 Plus, children may participate in nutrition and safety education, hula hooping, crafts, music, and more! Bike helmets for $6 and snowboard helmets for $20. The whole family may purchase helmets at this terrific price thanks to a generous donation from Legacy Foundations, Legacy Medical Staff and Trauma Nurses Talk Tough. Toddler to adult sizes available. Cash only. Car safety seats play a vital role in keeping your child safe. Please visit our Car Safety Seat Check-Up, located in parking structure 4 on N. Gantenbein Avenue. We will make sure that you are using your car safety seat properly. Bring your used or damaged car safety seats, and we will recycle them for FREE. Children will participate in fun, interactive activities like hula hooping, thumb casts, crafts and more and learn about summer safety and healthy eating. Parents can discuss immunizations records with nurses who will explain which immunizations are needed according to the age of their child. Visit http://www.legacyhealth.org/familyfun for directions and more information.